The book publishing process consists of the following steps to ensure a credible, transparent and efficient handling of book proposals and accepted manuscripts. Click here for information about journal publishing. 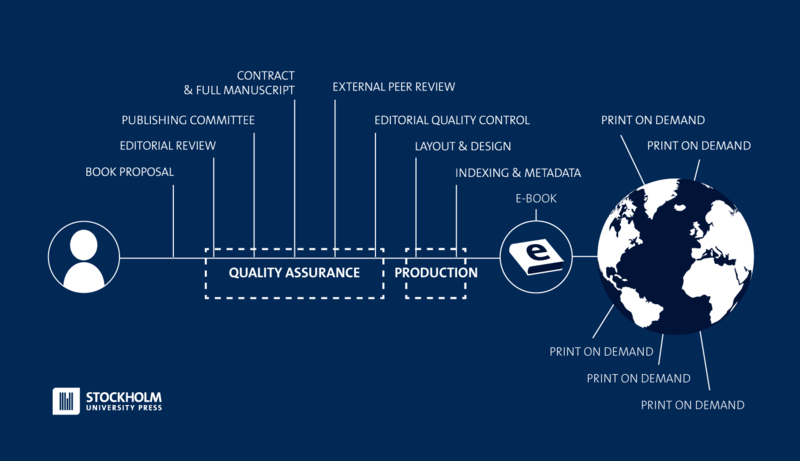 The book publishing process with Stockholm University Press visualised. If you wish to submit a book proposal, please complete the Stockholm University Press Book Proposal submission form online. You will need to register a user name and choose a password in order to submit your proposal. If you would like to edit the proposal offline, you need to download the form (Word file) and save it on a safe drive until you are ready to submit. Once submitted through the online form, the Stockholm University Press publishing office will direct the proposal to the relevant Editorial Board to assess whether the proposal fits within the scope of the Board to ensure a fair review process. All books published by Stockholm University Press are peer reviewed before publication. Submitted proposals are reviewed by a selected Editorial Board of experts within a relevant subject area, while book manuscripts are sent for external peer review. Read more about our peer review policies here. Decisions about book proposals are made based on the review of the submitted documentation by an Editorial Board and the Publishing Committee. If the proposal is accepted for publication, the author may be required to make revisions before submitting the final manuscript file. Full manuscripts will be sent for external peer review. The Editorial Board will select referees to comment on the quality and structure of the book. Read more about the criteria for selecting referees here. The Stockholm University Press Publishing Committee will consider comments from both the external review as well as the Editorial Board when making a final decision to accept the book for publication. The Publishing Committee at Stockholm University Press consist of elected academic representatives from all four faculties at Stockholm University. This committee makes all final decisions about book proposals and book publishing. Read more about the work in the committee here. To ensure that the books published by Stockholm University Press follow best practice for academic output, we require all authors to clearly state in their manuscripts that the data has been collected according to the ethical research code in each respective country. For Swedish authors, we recommend to use the Codex of the Swedish Research Council specific for humanities and social sciences, in Swedish and in English. Guidelines for any research with human subjects in Swedish and in English. There are also guidelines for research within natural sciences and technology in Swedish and in English. Researchers collecting data and conducting research in other countries should follow guidelines relevant to their context. Once the proposal is accepted for publication the author can submit the full-length manuscript via the manuscript management system. Instructions on how to submit are included in the acceptance letter from the Publisher. However, before submitting any manuscript files, we strongly recommend that authors read and adhere to the below instructions for creating manuscript files for consideration. Once the full manuscript file is submitted, the book will be sent to the Editorial Board to commence the external peer review process. The standard timeline for reviewers to submit comments is approximately 8–10 weeks. Most manuscripts will be then be sent back to the author for revisions based on these reviewer comments and those from the Editorial Board, before a final version of the manuscript is approved for publishing. This process is likely to take a minimum of 8-10 weeks. After the author submits the final edited manuscript files to the publisher it will take approximately 12 weeks to publish the book in electronic format on the publisher's website. During this time, the book will undergo formatting checks and layout and design procedures. The author will receive one set of electronic proofs to check before publication online. The book will be made available with a permanent link (DOI) with an open access license (CC BY) online. Our books are distributed internationally via a 'Print on Demand' service. We keep the retail price of the print books as low as possible for the buyer. All books have direct links on each book page for direct order of print version from the providers Amazon, Adlibris, Bokus or Book Depository. The books are available in high quality colour print, on a standard paper quality with variable cover board and size options. The available options are paperback or hardback, matte or gloss cover finish, as well as a choice of one of the three page sizes 140 × 216 mm, 216 x 216 mm and 156 × 234 mm. The author will be asked to make a choice about the print format options when submitting a book proposal. For retailers or other organisations who wants to order books see guidelines about distribution from our provider Lightning Source. It is also possible to contact Ingram Whole sales services for further information. The Book Processing Charge (BPC) for publishing services for a book of 70,000 words and 20 images (roughly 200 pages) starts from approximately £3,250 (+VAT). Quotes are based on the services required for the individual book as submitted by the author. The cost quoted includes all production (electronic as well as print), distribution to retailers and marketing as well as legal deposit copies according to Swedish law. Language editing and indexing creation are optional and can be added to the quote upon request. Prices are kept as low as possible and will be calculated based on the specific contents and format of the book being proposed. Information about potential funders for open access book publications can be found on our open access funds page. Please also get in touch with us regarding such funds and we might be able to offer assistance or advice.